Preheat oven to 400 F for puff pastry or 350 F for pie dough. Remove spice package from one “The Best” Lentil Soup and set aside. Combine 3 cups of water with lentils and bring to a low rolling boil. Simmer until water has been absorbed and lentils are tender. Remove from heat and add spice package, 1/2 cup mashed potatoes and 1 tsp. of cinnamon. Stir well to incorporate. Line a muffin tin with pie dough or puff pastry and spoon in filling. Top with a small amount of HP sauce (optional). Combine Potato & Herb soup mix with 2 cups of boiling water, stir thoroughly and then allow to cool. Add enough flour to make a workable dough, approximately 1 3/4 cups. Take a handful of the dough and roll on a lightly floured board until it is a long cigar sized log. Bring a pot of salty water to a boil and add the raw gnocchi. Once the gnocchi floats to the top, remove with a slotted spoon. Repeat until all gnocchi are cooked. Serve with your favorite sauce and fresh Parmesan cheese. Remove the spice package from “The Best” Lentil Soup and set aside. Combine 3 cups of water with the lentils and bring to a low rolling boil. Simmer until water has been absorbed and the lentils are tender. Remove from heat and add the spice package, 1/2 cup of mashed potatoes and 1 tsp. of cinnamon. Stir well to incorporate. Line a muffin tin with puff pastry or pie dough and spoon filling in. Prepare one package of Spiced Biryani Rice as per package directions. Rub one 1 tbsp of oil or butter over a cast iron fry pan. Line pan with 1 cup of sliced carrots. 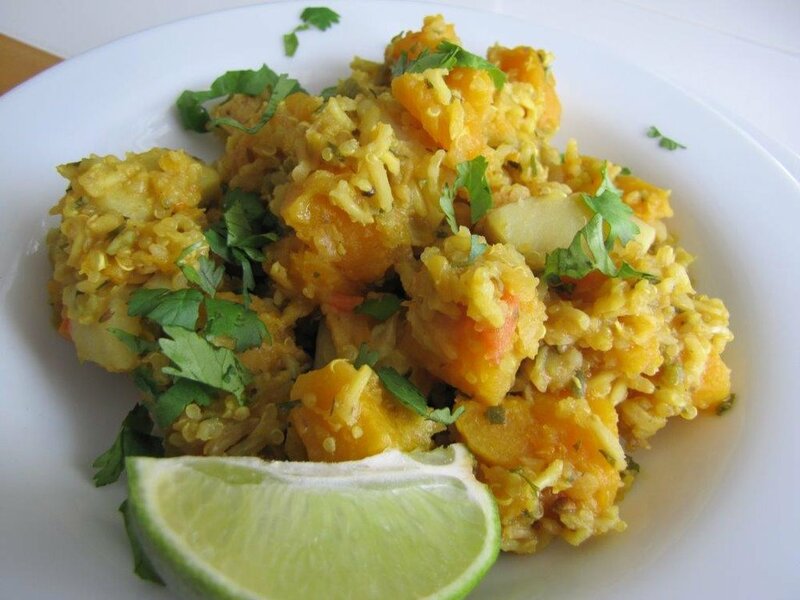 Combine 2 cups of rice with 1 can of drained & rinsed chickpeas, then spread over-top of the carrots. Top rice with 1 cup of sliced zucchini and 1 medium sliced onion. Bake at 350 F for 30 minutes. Salt and pepper to taste. 1. Butter a cast iron pan or baking dish. 2. Thinly slice 2 to 3 large potatoes (5-6 small) and lay them along the bottom and up the sides of the pan. 3. Top with 2 cups of fresh spinach. 4. Top with 5 slices of fresh mozzarella. 5. Combine 1 package of Tomato Spinach Soup with 1.5 cups of milk and 2 eggs. 7. Top with more mozzarella slices and half a dozen sliced cherry tomatoes. 8. Bake at 400 F for 30 to 40 minutes. 1. Prepare Burgerizer as per instructions and set aside. 2. Preheat oven to 350 F.
3. Combine filling ingredients including the Burgerizer, 3 chopped green onions, 1 jalapeno chopped or for more heat a scotch bonnet, 1 Tsp. allspice, 1/2 cup diced green peppers (I used a poblano for the extra flavour), 1/2 Tsp. thyme, 1 clove mashed garlic, 1 Tbsp. oil and mix well. -combine dry goods including 2.5 cups flour, 1/2 tsp salt, 2 Tsp. baking powder, 2 Tsp. curry powder. -using a fork or pastry cutter cut 2/3 cup of butter/shortening or margarine into the dried mix until crumbly and resembles coarse oatmeal. - combine 1 egg and 1 cup of water. - slowly add approx 2/3 of the water/egg mix until soft dough forms. Set the rest of the water/egg mixture aside as a wash for the pastries. - divide dough into 8 equal balls. 5. Roll each ball of dough into a circle and spoon filling on one half. 6. Fold the other half of the dough over and seal edges with a fork. 7. Place patties on parchment lined sheet, brush with the egg mix and bake for 30 min or until flaky golden deliciousness. Serve warm or cold :) This recipe makes meal-sized portions. You can divide the dough into 12-16 to make smaller sizes for snacks. Vegan Alternative: you can remove the egg and add 2 additional Tsp. baking powder. Remove spice package from Chipotle Black Bean Chili and set aside. Soak black beans overnight in 4 cups of water and drain (or use a quick soak method detailed on our website). Boil black beans in water for approx 30 minutes until soft; drain. Combine the spice package with the black beans. Lay one package of tortillas flat and spread with black bean mixture. Top with grated cheddar cheese and diced red pepper. Fold tortillas and place in hot cast iron pan coated with oil. Cook until warm, flipping once. Serve with everythingnice guacamole or salsa. You can also add hot sauce before you fold them. Excellent served with sour cream. This makes 8 small servings; 4 to 6 if you use large tortillas. They can be made ahead and frozen for great lunches! If you are looking to cut carbs or remain gluten free, skip the tortillas and make burrito bowls instead. Layer the bean mixture, cheese, red pepper in small bowls. There are endless add ins including shredded lettuce, diced tomatoes, avocado, corn and salsa. Healthy and amazing! 2. Remove spice package from Burgerizer and set aside. 3. Combine Burgerizer with 2.5 cups of boiling water and set aside. 4. Combine spice package with a 28 oz. can of tomatoes. 5. Finely chop 1/2 of a medium sized cabbage. 6. Combine all ingredients in a baking dish. 7. Cover and bake for 1.5 hours until rice is soft and plump. 8. Serve warm as side or main. 1. Peel and cut butternut squash into 1 inch pieces (approx. 4 Cups). 2. Cut potato into 1 inch pieces (approx. 1.5 Cups). 3. In a large saucepan, heat 1 Tbsp. of oil and lightly brown the squash and potato until some slight golden edges appear. 4. Add Cosy Quinoa & Rice soup kit as well as 3 cups of water. 5. Add 2 cloves of garlic and .5 Tsp of cumin (optional). 6. Simmer over medium/high heat for 20-25 minutes until rice is tender and water is absorbed. 7. Serve warm garnished with cilantro and 1/4 lime (optional). 1. 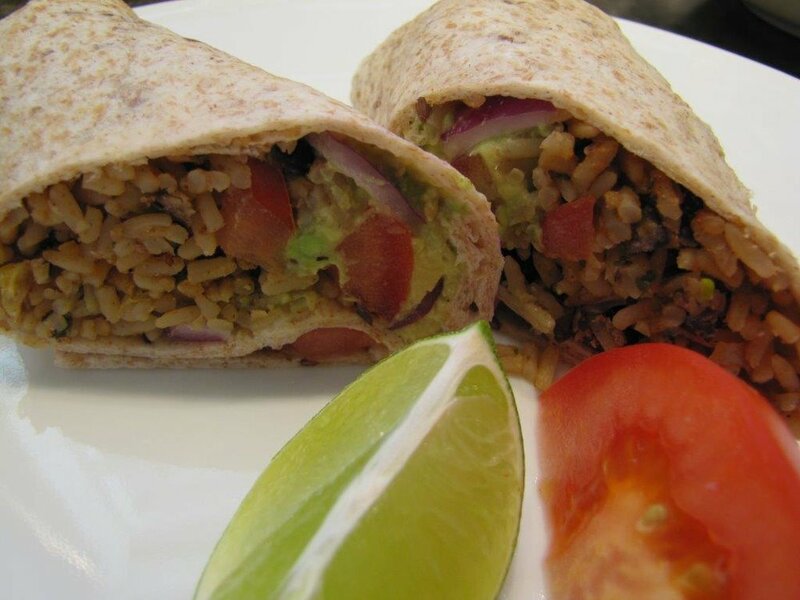 Prepare Everythingnice Zesty Mexican Rice & Beans as per package instructions. 2. Place 1/2 to 3/4 Cups of rice on desired tortilla shell. 3. Top with your favorite toppings. Such as Everythingnice Guacamole & Salsa Mix, diced fresh tomato, chopped green onions or red onion, cilantro or hot sauce. 4. Roll and Serve for the whole family to enjoy. 1. Bring 2 cups of water to a boil and add contents of Everythingnice Wild Mushroom & Barley Soup. 2. Simmer over medium-low for approx. 20-25 minutes until water has been absorbed. 3. 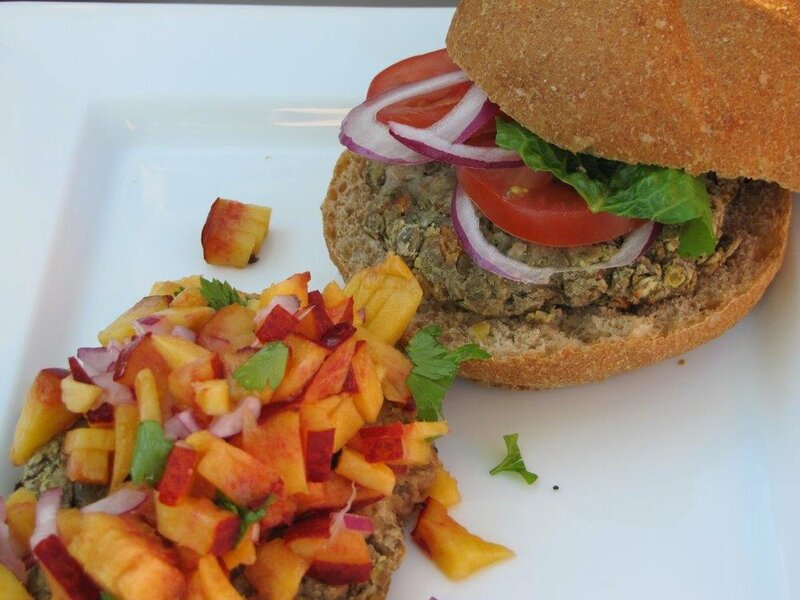 Combine with fresh chopped veggies such as zucchini, eggplant, kale or tomatoes. 4. Cut the tops off of 4 peppers and remove seeds. 5. Fill the peppers with the mushroom & vegetable medley and place the caps back on. 6. Place the peppers in a baking dish with 1 cup of water and cover with foil. 7. Bake for 30-45 minutes depending on your desired texture. Tossing some cheese into the mixture is also a nice touch. 1. Bring 2 cups of water to boil and add "The Best" Lentil Soup. 2. Simmer over medium-low for 35-40 minutes until most of the water has been absorbed. 3. Allow the lentils to cool until able to handle them. 4. Combine with 1/2 cup of bread crumbs and mix into the lentils. 5. Start to mash the lentils slightly with your hands as you form them into patties. 6. Lightly oil both sides of the patties and place on the barbecue for 8-10 minutes. 7. This recipe will make 6 patties, they can be prepared the night before and cooked later or even frozen. 1. Soak the chickpeas overnight or see our Kitchen Tips Page for information on a quick soak method. 3. Combine chickpeas, spice package, one 28 oz. can of diced tomatoes and one cup of water in a pot and bring to a boil. 4. Simmer for 40 minutes. 5. 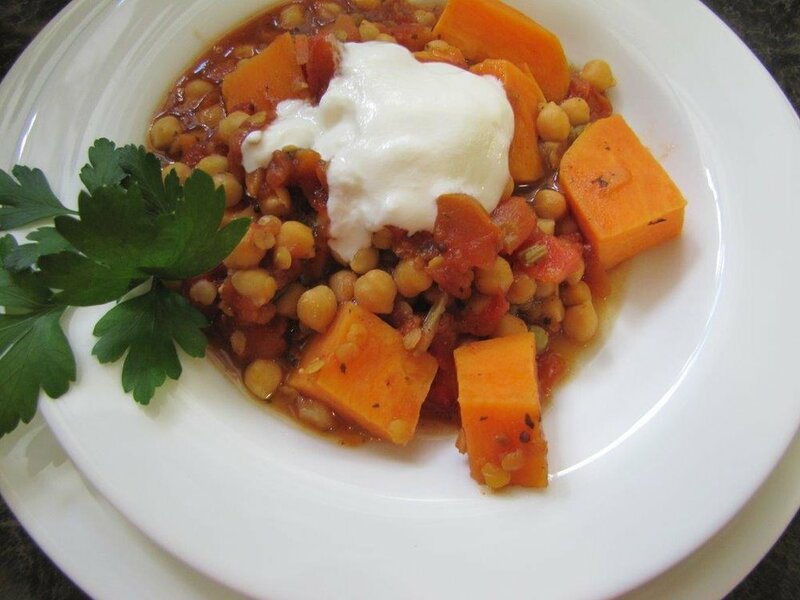 Add one or two diced sweet potatoes and simmer for an additional twenty minutes until chickpeas are tender. 6. Serve with a dollop of yogurt. 1. Brown 1.5 cups of sliced mushrooms in 1 Tbsp. of oil. 2. Combine 4 cups of cold water, 2 Tsp. of Worcestershire sauce and 1 Tbsp. of flour in a medium size pot with Everythingnice Burgerizer. 3. Simmer for 45 minutes until rice is tender, the mixture will form a delicious gravy. 4. Boil 2 chopped potatoes in water, once tender, drain and mash with butter and cream. 5. Place Burgerizer mixture in a casserole dish, top with frozen peas and/or carrots (if desired), then top with the mashed potatoes and a dollop of butter in the middle. 6. Bake at 350 F for 30 minutes until potatoes have browned. SERVE and EAT!!! 1. Combine the spice package from the Cucumber Dill Pasta Salad with 1 cup of sour cream and set aside. 2. Bring water to boil and cook pasta until al dente. 3. Saute 2-3 cups of sliced mushrooms in 2 Tsp. of oil until slightly browned. Add sour cream mixture and 1/4 cup of water. 4. Drain the pasta and keep it in the pot. 5. 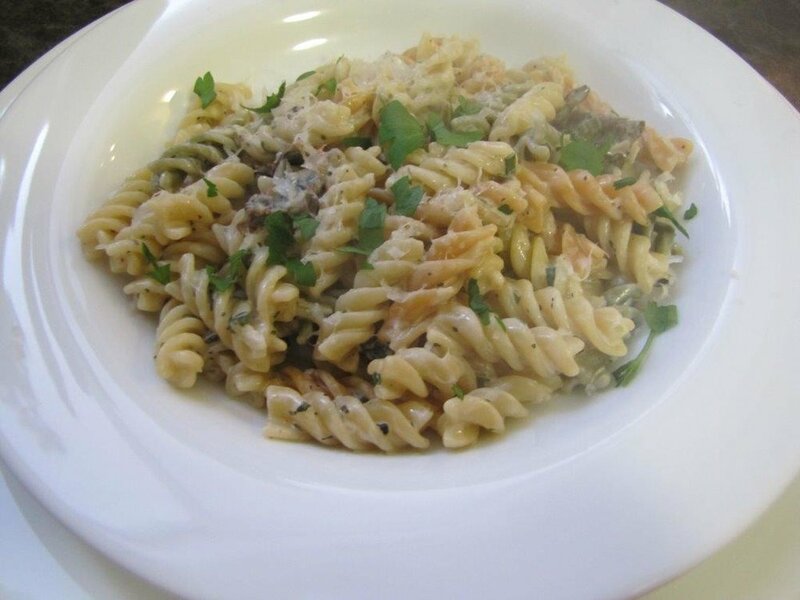 Serve mushroom sauce over hot pasta. 1. Combine 1 1/4 cup of cream, sun-dried tomatoes, spice package and 1/4 cup grated Parmesan cheese; set aside. 2. Bring water to a boil and cook pasta until al dente. 3. Drain pasta and return to pot. 4. Add cream and spice mixture and simmer on medium for approx. 5 minutes until the cheese melts. 5. Add roasted red peppers and baby spinach (optional). 1. Combine one package of Everythingice Split Pea & Portobello Mushroom Soup with 2 lbs. of potatoes cut into 2-3" pieces, 3.5 cups of water and 2 Tbsp. of butter or margarine in a crock pot. 2. Cook in high for 3 hours or on low for 6 hours. 1. Prepare 1 package of Everythingnice Marinara Sauce as per instructions. 2. Cook 1 package of lasagna noodles as per instructions. 3. Saute 1 small diced onion in 1 Tbsp. of oil. 4. Add 2 cups of fresh spinach and toss until wilted - allow to cool. 5. Combine spinach/onion mixture with 1 250 ml. of ricotta cheese. 6. Take each lasagna noodle and lay flat, spread ricotta mixture evenly over noodles and roll. 7. Pour 1/3 of the marinara sauce in the bottom of a 9 by 12 baking dish. 8. Lay each roll side by side in a single layer over the sauce. 9. Top with the remaining marinara sauce and grated mozzarella cheese. 10. Bake at 350 F for 30-35 minutes. 1. Combine one package of everythingnice Split Pea & Portobello Mushroom soup mix with 2.5 cups of water and bring to a boil. Reduce heat to medium/low and simmer until peas are soft and water is absorbed. 2. Clean 1 head of Boston or leaf lettuce lettuce, chop 1 bunch of green onions and shave or julienne 1 carrot - set aside. 3. Dressing: Juice 1 lime and add: 1 Tsp. of white sugar, 1/4 cup of oil, salt & pepper to taste. 4. Lay lettuce on a plate and top with the pea mixture, green onions and carrots. 5. Drizzle with dressing and serve. Note: The pea mixture can be prepared in advance and either heated up or used cold. Feeling adventurous? Add fresh sprouts, chopped red peppers or even fresh grated coconut! 1. Combine one everythingnice Cosy Quinoa & Rice soup mix with 3 cups of water and bring to a boil. Simmer for 25 minutes or until rice is tender. 2. Slice your 1-3 (depending on size) zucchini in half lengthwise and scoop out the seeds....this forms your boat. 3. Stuff the hallowed cavities with the Cosy Quinoa & Rice mixture and top with 1/2 cup grated cheddar cheese. Asiago or Gouda would also work well. 4. Bake at 350 F for 30-45 minutes depending on how soft you like the zucchini. 1. Combine one package of everythingnice Cucumber Dill Pasta Salad (pasta and spices) with 1/2 pkg. of cream cheese, 2 cups grated cheddar cheese, 2.5 cups milk and 1/4 cup butter in Crock Pot. 2. Cook on low for 2 to 2.5 hours, stirring once per hour. Serve hot with sliced tomatoes or a side salad. For a heartier meal add leftover diced ham or chicken for the final 30 minutes. Enjoy!! 1. Remove spice, raisin, and almond packs from a package of everythingnice Sweet Curry Pasta Saladand set aside. 2. Add pasta to boiling water and cook until Al Dente. 3. Drain pasta but save 1/2 cup pasta water. 4. Combine pasta, 1/2 cup cream cheese and spice package in pot and stir over medium low until combined and cheese melted. 5. Add roasted red peppers, raisins and almonds (optional). Notes: you can also substitute sundried tomatoes for the peppers...or use both. 1. 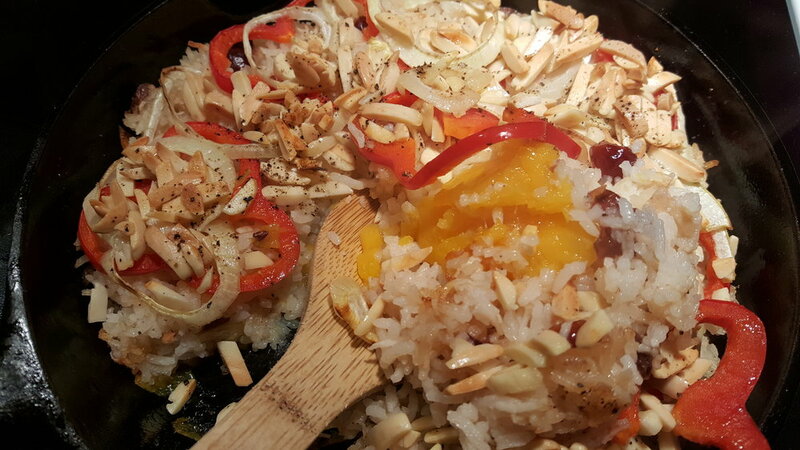 Prepare one package of everythingnice Kaffir Lime Coconut Rice as per package directions or use leftovers. 2. Lightly butter bottom and sides of cast iron pan or glass baking dish. 3. Peel and slice one ripe mango and spread on bottom of pan in single layer. 5. Top with 5-6 slice each of red pepper and onions. 6. Melt 1 Tbsp. butter and mix with 1/3 cup slivered almonds. Spread almonds on top. 7. Bake at 350 F for approx 30-45 min until almonds are golden. Notes: You can also add diced tofu on top before baking or uncooked boneless chicken thighs for a complete one pan meal. 1. Soak the beans from one package of everythingnice Texas Chili as per instructions on the package. 2. Prepare chili as per instructions (WITH ONE EXCEPTION - use only 1 cup of water). 3. Once the chili is cooked and beans tender (approx. 30 min) you can start building your lasagna. Begin with one layer of the chili; top with the corn tortillas. Repeat 2 more times. 4. Add 1 250 ml. package of cottage cheese as a layer on it's own. 5. Add two more layers of chili topped with tortillas. 250 grans of grated old cheddar cheese. 7. Bake in a 325 F oven for 30 minutes until cheese is melted and the dish is heated through. 8. Serve with sour cream (optional). - You can substitute the cottage cheese with ricotta, or omit that layer entirely. - You can substitute any of the everythingnice chili kits. You can also prepare the chili in advance but the final cooking time may need to be extended 45 minutes to make sure the dish is heated through. - The corn tortillas tend to break up more than a traditional pasta noodle but the texture and flavour is awesome! 1. Combine soup mix with 2 cups of boiling water, stir thoroughly and then allow to cool. 2. Add two eggs, beaten. 3. Add enough flour to make a workable dough, approximately 1.5 cups (save rest for rolling). 4. Take a handful of the dough and roll on lightly floured board until is a long cigar sized log. 5. Cut into bite sized pieces. 6. Bring a pot of salty water to boil and add the raw gnocchi. 7. Once the gnocchi floats to the top, scoop out with a slotted spoon. Repeat until all are cooked. 8. Serve with your favorite sauce. We just browned some butter with fresh sage and added a bit of fresh Parmesan cheese....delish!! This gnocchi has more texture than plain potato gnocchi due to the tomato bits etc in the soup. Enjoy! !